BoyScoutingIs4Boys – Page 35 – Let our boys be boys. I stumbled on this today looking for material to train our Webelos scouts for their Arrow of Light award. The present handbooks are simply awful — the Soviets wrote more inspiring manufacturing reports, translated into English than the soul-killing, mind-numbing awful that is the Boy Scout Handbook series today. The Art of Manliness blog — one of our favorites! — took a close look at the Centennial edition of the BSA Handbook and compared it to the classic original. This portion was largely inspired by a 2013 Clairmont Institute essay by Kathleen Arnn. What has been dropped or reduced in the modern handbook is telling. Gone is the section on chivalry, which traced the Boy Scouts’ heritage back through the pioneers and Pilgrims, and to the knights of the Middle Ages. While the 1911 handbook has a lengthy chapter on Patriotism and Citizenship (including a letter from Theodore Roosevelt on “Practical Citizenship”), which outlines the history of the United States, the meaning of the flag, and the purpose of various governmental bodies, the modern handbook has greatly shrunk the discussion of such things in both length and detail. The original is also generously peppered with references to great men in history for young boys to emulate, while the mention of such “heroes” is almost entirely absent from the one published in 2009 (being inspired by history isn’t much in fashion these days). Arnn’s original essay — well worth the five minutes it takes to read completely — may be found here. Perhaps we shall post on it later. AOM’s contribution was to compare merit badges from 1910 to merit badges of 2010. As there are a number of badges that survived the century, this was a straight forward task. The results are a side by side set of graphics with the requirements of each. what stands out for all the modern badges is how much longer and more involved the guidelines are today than they used to be. 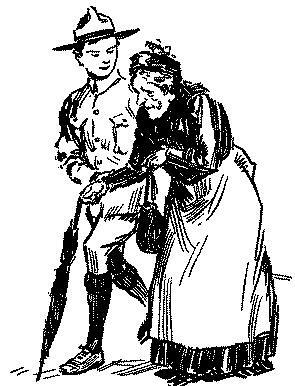 In the 1911 handbook, earning each badge involved the completion of a short list of one-sentence requirements. Modern badge requirements, on the other hand, run to as many as ten paragraph-long sections, the first of which is always a discussion of the need to discuss safety considerations with one’s leader. The gardening badge for example, requires the Scout to discuss with his counselor what hazards he might encounter if he happened to unfortunately plant his tomatoes near a beehive. All old time Scouts see this. The result is that Scouting is perhaps more boring even than school, so the handbooks become expensive bricks, heeded mainly in the breech. Camping is the activity for which the Boy Scouts are best known. In comparing the original camping merit badge to today’s, one can see how the hands-on requirements have been loosened; for example, Scouts formerly had to sleep out for 50 nights, know how to build a fire without matches, and construct a raft. On the flip side, the modern badge has decreased that requirement to 20 nights, and has greatly expanded the more mental requirements — making checklists, creating plans, and describing different camping guidelines and pieces of equipment. Yes, you read that correctly. Our boys were expected to invent something and patent it. The old handbook spoke proudly of the chivalric tradition; the new apologizes for the antiquated example of the knights. It sandwiches a few cursory paragraphs on moral virtue between a lengthy discussion of drugs and alcohol and a section on sexual responsibility. Moral choices are reduced to healthy choices. Doing the courageous thing becomes equivalent to refusing a cigarette at a party. BSA was and remains a hollow shell of its formerly unquestioned status as the premiere training ground for our sons. Pandering to POCs became its own priority, even to the neglect and insult their core audience. Membership is in free fall because BSA doesn’t want white boys. They don’t want patriots or Christian believers. 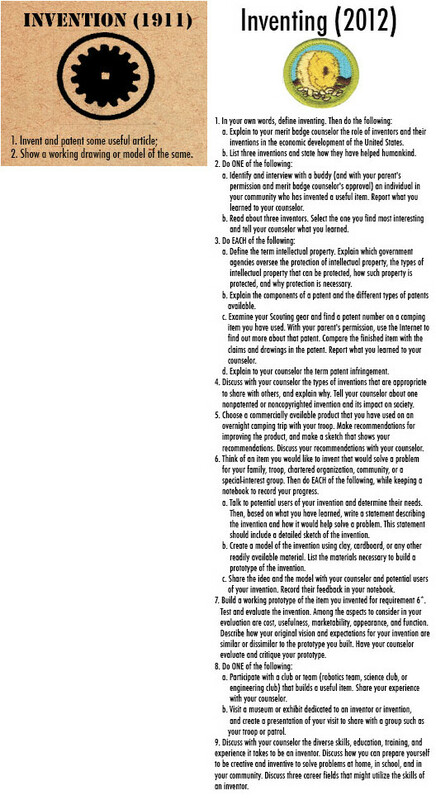 They want your money and are willing to extract it from you by the extortion of your sons. What would the knights of old do? Enoch Heise’s post “How to Spot a Broken Chain of Command” should be required reading by all Scouters and fathers that give a damn about their sons’ upbringing. More than that, it shouild be required reading for all BSA employees and “leaders” — starting with district and council executives. There are two ways that this chain can be broken. The first is by an absence of clearly defined leadership. Scouts become confused. They will get frustrated because they don’t know who is supposed to be calling the shots. Do you know who runs Scouting in your area? You should. Find out and retake command of your son’s scouting experience. Learn about professional and volunteer leadership positions (“Scouters”) in the BSA Inc. by reading this article at Infogalactic. It seems long ago for those of us in the trenches of the American kulturkampf. 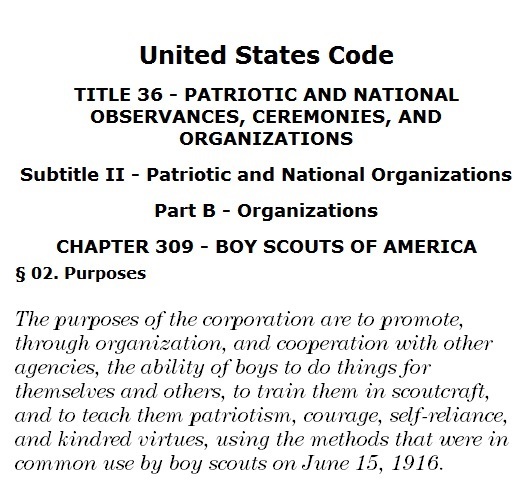 But it really hasn’t been long at all since BSA actually believed the words they spoke, starting with the Scout Oath and Law. Check it out. Then hold them to it. Every. Single. Letter. UPDATE: Would those millenial democrats be the same millenials who think Communism sounds pretty chill? The only segment clearly in favor of this move is “millennial democrats” who are the absolute least likely ever to consider joining the Boy Scouts. Clearly, market appeal had nothing to do with this decision because any half way competent survey would have revealed the exact same result. How many of you remember “Scouting/USA”? It was the first go at unisex, un-boyed, un-Americanized scouting in 1972ish. It even featured a new red logo, red being the standard issue color of the international socialist revolutionary movement i.e., communism. 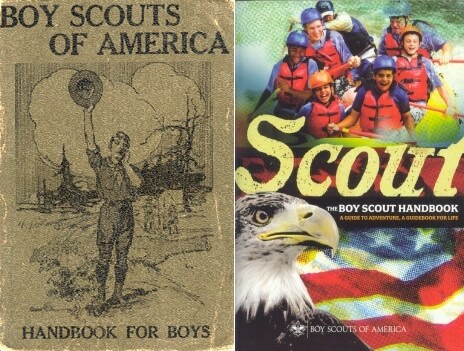 The handbook was stripped of scoutcraft, community organizing, “child rearing”(! ), drug use, and trendy conservation taking its place. Membership collapsed and BSA had to hire back the hated Green Bar Bill Hillcourt to pick up the pieces. A majority of Americans oppose the decision by the Boy Scouts of America to start admitting girls next year, a new poll from NBC News and the Wall Street Journal shows. But, as with many other issues in the current polarized era, political ideology has a lot to do with how the public views the new policy. 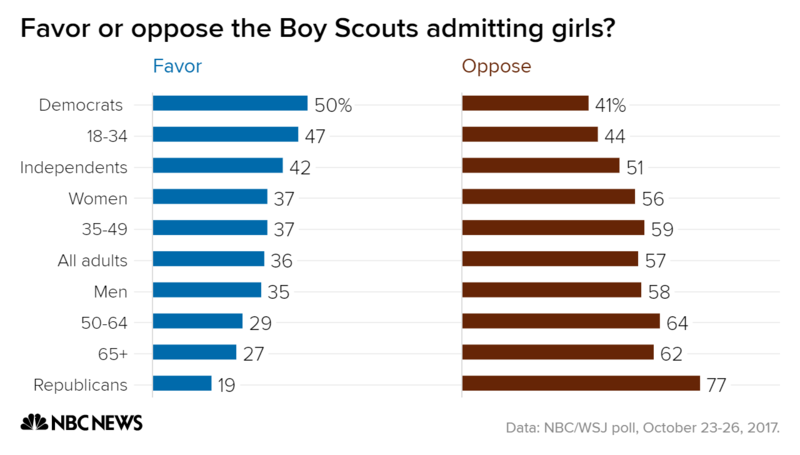 Nearly six-in-ten Americans — 57 percent — disagree with the move to allow girls to join the Boy Scouts, with 37 percent voicing strong opposition.